Governments of the world: arm all nuclear launch codes, disband your legislatures, and send your drones to the sky: Taco Bell is preparing not one but two new flavors of its diabolical Doritos Locos Tacos. This time, prepare. After depleting its 85 million strategic reserve of cheese shells and selling a staggering 100 million weaponized hybrid tacos, the company is now poised to release two new variants: Cool Ranch and "Flamas," which seems to be derived from an Esperanto word. Judging by the packaging, it looks like it's some kind of "spicy" flavor, but who ever knows with Esperanto, right? Maybe it means squid skin, or is just spray-coated with bath salts. 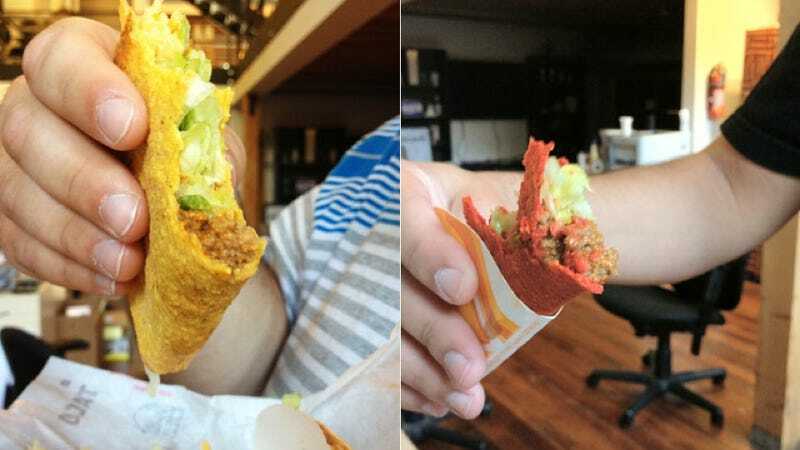 The Cool Ranch Doritos Locos Taco shell is the one people will be talking about for weeks when it goes national. It utilizes the same subtle tones that don't hammer the flavors down your taste buds - the way the original nacho cheese version tasted. For fans of Cool Ranch Doritos, the taco doesn't disappoint.